"Fairy Tale Roses" by Anna Tewes is one of nine paper collage pictures the Albany artist will display in May at Gallery Calapooia. 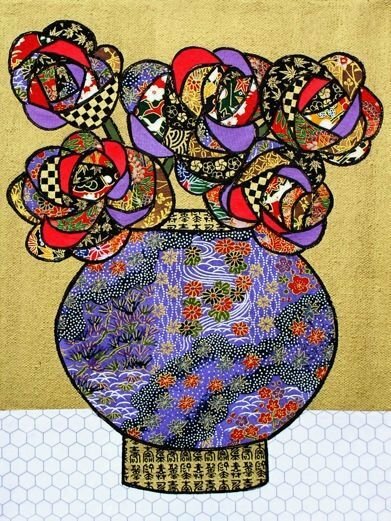 "Vase" by JoAnne Walstad, one of the eight students in Anna Tewes' paper collage workshops who are displaying their artwork this month at Gallery Calapooia in Albany. "Swan" by Heidi Stolp is one of the pieces on display this month at Gallery Calapooia. Anna Tewes enjoyed using paper to make trees, leaves, flowers and other designs for her classroom bulletin board at Ashbrook Independent School. When the preschool and kindergarten teacher ran out of budget money to buy more paper in the middle of the school year, she decided to do something else with the cutouts. "The children and I started creating pictures with them, and that is how my paper collage art started," Tewes said. Tewes, who has a background in graphic design, stencil creation and flower arrangement, has been a paper collage artist for the past decade, and displayed her pictures in galleries and other venues throughout the valley. She has collected of internationally handmade papers, traveling to Japan, Italy and other locations to see how other countries and created their paper. "If you look around at nature it has color, shape, and texture," Tewes said. "The thing I like about paper is it has texture in it, and when I create my pictures it creates a really natural look." She has also taught collage workshops from her home studio, a historic house in downtown Albany. Tewes and eight of her students are the featured artists for May at Gallery Calapooia. The exhibit opens Friday night with an artists' reception. The gallery has nine of Tewes' creations, featuring a variety of figures, floral images, landscapes and more. Nearly 20 collage pieces will be showcased by her students: Susan Heaney, JoAnne Walstad, Heidi Stolp, Susan Soukup, Dee Elletson, Joy Massey, Carla Wightman, and Anna Hartley. Most of the women displaying work in the gallery, including a few artists themselves, are retired and have taken all of Tewes' workshops. She teaches a three-hour, one-day workshop for seven to 10 students about once a month. Tewes said using paper is more accessible to teach color and design, because people can either tear or cut shapes they want, lay them out and decide what their picture will be. "You can have something successful the very first day you create a picture," she said. Tewes provides the paper, usually 20-by-30 inch handmade pieces in many different colors, a general direction and the parameters for students to work with. "I create a theme. Sometimes it's trees, or reflections and shadows, or flowers. I lead them through creating their own collage, so they can finish in three hours and take it home with them," she said. From there, Tewes likes to give the students room to create on their own from there. The eight artists are sharing two pieces each from the various theme-based workshops, including birds and branches, florals, and landscapes, Tewes said. And the workshops often are just the start. "Many of them are doing work outside of the classroom now, which is really fun to see. Their creativity is growing in the technique," Tewes said. WHERE: Gallery Calapooia, 222 First Ave. W., Albany. Gallery hours are 11 a.m. to 6 p.m. Tuesday through Saturday. INFO: For more information, see gallerycalapooia.com or call 541-971-5701. More information about Anna Tewes and her workshops is available at annatewes.com.